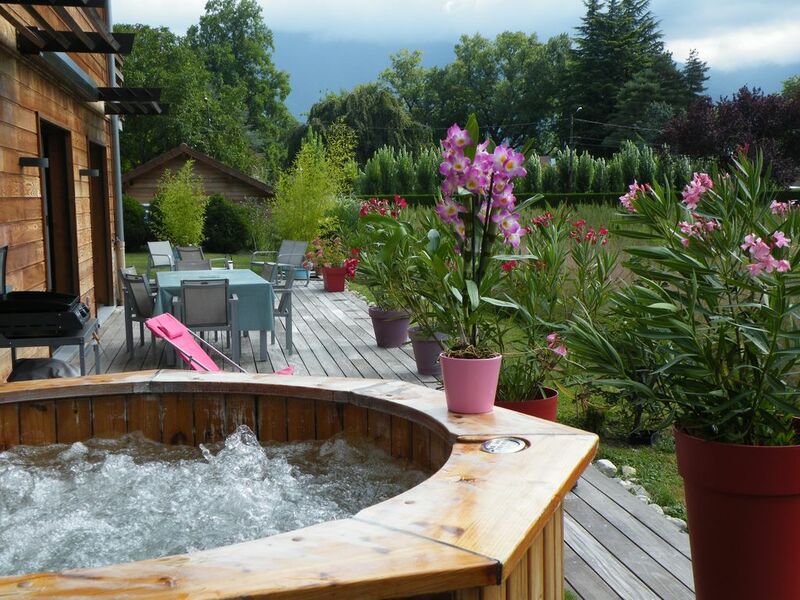 Rental of individual to private, in the heart of Haute Savoie, on the edge of Lake Annecy and 10 minutes from the old town of Annecy this recent contemporary house has all the assets for a relaxing holiday but sports in the fresh air mountains of Savoy. The Bauges Regional Park is a 10-minute drive away and plenty of water sports are possible: paddle, rowing, water skiing, canoeing, wake boarding and many other sports activities available in a very close perimeter of the house: biking on bike path, tennis, rollers, trampoline, fishing, mountain walks in the Bauges Regional Park, paragliding, canyniong or via ferrata. The house is located 5 minutes by bike from all the shops that are needed on holiday (supermarket, bakery, butcher, regional cheese, primeur, BIO store, restaurants and local market with regional products). You will appreciate the contemporary decoration with the acidulous colors of the interior of the house and the accent is on the quality of the equipment: upscale bedding, quality furniture, free wifi by live box of orange, Nespresso coffee machine. The Conciergerie service guarantees you a personalized and friendly reception, and commits itself to a clean and impeccable place. You will find a cozy home with beds made on arrival, towels provided. You will be spoiled for choice to discover small regional restaurants of quality but also gastronomic tables recognized by the best guides. We have stayed in Sevrier many times, but this accommodation made our holiday the best one ever. The location, a stone’s throw away from both the bicycle path and the lake, makes it ideal. As far as the accommodation goes, there is nothing lacking .The beds are extremely comfortable, the kitchen is well stocked with all the necessary utensils and the WiFi is really fast. We were six adults and we never felt cramped at any time. There is only one thing to consider - the fridge/freezer is not adequate for a large household. We had extremely warm weather this year and as a result the fridge limited us in storing cool drinks. The freezer is merely an ice box which meant that shopping was required on a daily basis if you are catering in. (A small inconvenience which does not detract from the experience as there is a really good supermarket very close by) Thank you to both Catherine and Virginie for all your assistance before and during our stay. We will most certainly be back next year. Summers are more and more hot and you're right, the house needs a larger freezer ! We always take in account the feedback of our clients and make the house as pretty and comfortable as possible. It is our pleasure to make our clients very happy and make them regular. We spent a week at the end of July/beginning of August with our two young children (aged 6 and 7). Communication prior to arrival was very good, and Virginie met us at the agreed time to show us round. The villa was very well presented and equipped, and in a beautiful location. The cycle path runs very close to the house which we used a lot, and via that there was easy access to great beaches and restaurants. We also enjoyed barbecuing and eating out on the terrace several nights - there are two supermarkets close at hand (one walkable), and a great bakery also walkable to go and get breakfast. There was plenty to do for the children in the area, and we had a great time there. Our only minor grumble (and not really anything the owner could do anything about) was that the disco at the nearby campsite could be heard until 11:00pm. It wasn't at a level that kept anybody awake or was a major disturbance, but it would have been perfect to have have sat outside in the evening and enjoyed a little more peace. This certainly didn't spoil our experience of the villa or our holiday though. THanks a lot for your feed-back. Yes, the luxury camping around 500 m from the house is a little noisy with the music during Holidays (july and August only)but as you said it isn't an important disturbance. We are happy you spent good family holidays in our house and we would be very glad to welcome you another time. We really enjoyed our stay in this super cute chalet. Its not overlooked in summer. I imagine you can see the lake in the winter.,It's well equipped , clean and comfortable between the bike bike path & the lake. There is a supermarket within walking distance and a bakery, pizzeria, bikeshop.. so many activities close by. It's a very good location for an active holiday. Maison tout à fait conforme à sa description et fidèle aux photos du site. On peut aller au lac à pied, la fabuleuse piste cyclable est à 100m, les commerces sont facilement accessible et tout ça, au calme dans un environnement champêtre. Nous avons apprécié la propreté, la qualité de la literie, l'agencement et la décoration, le jardin très bien entretenu, la douche solaire .... Le site de paddle est à 2 pas, et les locations de vélo aussi. Merci beaucoup. Au plaisir de vous revoir l'année prochaine, nous sommes contents que vous ayez passé de belles vacances. The house was beautifully clean, comfortable and well equipped. It was less than five minutes walk from the lake, so we could easily carry the canoe and paddle board to the lake edge. The rowing club access to the lake was lovely, amazing scenery and no problem using the pontoon. The cycle path was also 5 mins away with very safe cycling all around the area. Supermarkets easily accessible by bike as were places for drinks and ice creams. Eating out in the area was very expensive so we didn't do much of that. Overall a really fabulous family holiday (kids aged 11 and 13 loved it, as did we). Thank you so much, your descriptions were completely accurate and very helpful. Maison spacieuse, proche de tout : du lac, des commerces, de la piste cyclable, du site de paddle. Elle est bien équipée, les lits sont confortables et l'accueil remarquable. Rien à redire, tout est bien. La wifi marche bien, la TV aussi, le barbecue aussi ... bref aucune mauvaise surprise c'est tellement rare .... Nous reviendrons !! About 400m from the Albertville linking Annecy, road Mongets is, in fact, a way 'dead end'. It serves the residents and the rowing club. The bike path located 100m from our house allows you to make all your trips by bike. You are at 6/12 minute drive from the center of Annecy, depending on the time of travel. Outdoor activities are endless around Lake Annecy. Whether paragliding, water sports, hiking, biking or horseback riding, all sports are represented. Even in winter you can reach the Semnoz ski resort in 20 minutes by car. Snowshoe walks or simply walk to enjoy the snow and its magic. (A ski hire is in the immediate vicinity of the house). The area between the two Savoies is rich, good restaurants, local products to discover, and especially the city of Annecy and its old quarter, which is nicknamed 'Little Venice'. Tourist guides are available in the house. For those who need, for professional reasons, to stay near Annecy, we propose the formula 'midweek' from Monday to Friday.